However...I had kind of been feeling like perhaps I should be sewing something rather than spending all my free time binge watching Outlander and Scandal but couldn't think of what. 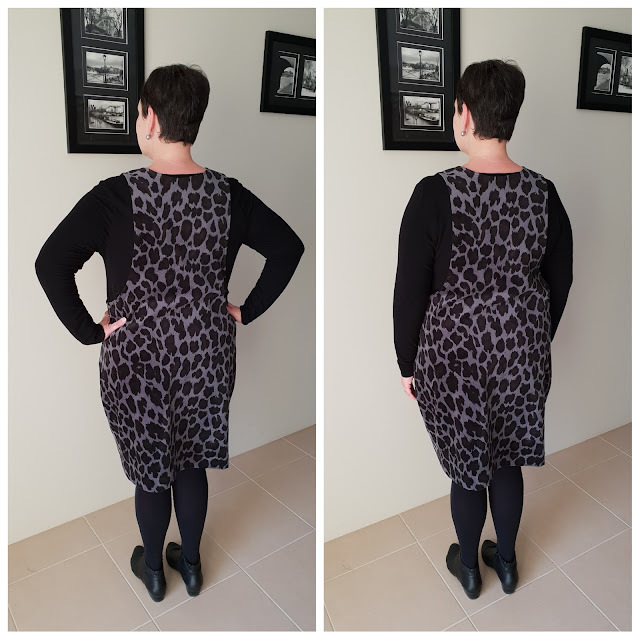 I had seen the release of the York Pinafore pattern by Helen's Closet but dismissed as "not for me, not my style" until I heard her talking about it on her podcast...it seemed like a simple sew, in my size range and I had some fabric in the stash that would be perfect for it (a long sold out Cotton/Elastane Stretch Woven Velveteen from Tessuti that I had leftover of from another project). Thus...here we are! The pattern comes with two options for different types of "patch pockets" but I decided to go sans pockets as I felt it would make the pattern more "streamlined" and also because my sewing is not that neat or straight and dodgy pockets will make the pinafore look homemade in the worst kind of way. I was also jumping right in with my "good fabric" and fitting pockets into a side seam was more than I could bear as it meant basting...ugh ugh. Turns out that was a good decision as I ended up taking in the side seams but 0.75cm each as the cocoon shape was just too much fabric at my hips. 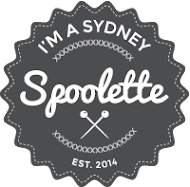 I have been thinking about going back and perhaps adding in the kangaroo pocket so watch this space. Overall this project was a quick and satisfying sew, made even more so by leaving off the pockets. Using bias binding is always super fiddly and slow but it does give a pleasingly neat result that makes me smile smugly whenever I look at it. I sewed the largest size there was (XXL), and also added an inch to the upper bodice straps to account for a bust size that is bigger than the pattern is drafted for. 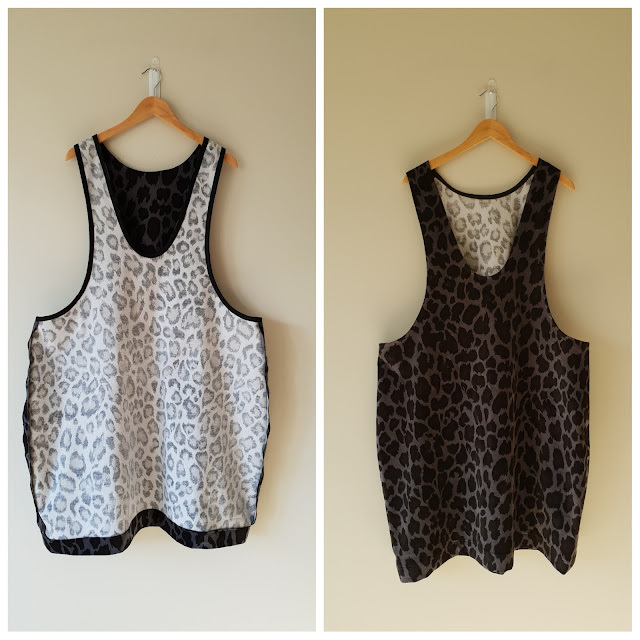 There are two neckline options and I sewed the more scooped neck version. I ended up taking in the side seams about 0.75cm as it was just too big and I would like to straighten up the seam around the hip area as there's just too much fabric there making me feel bigger than I am. I sewed the longest length available but am going to unpick the hem and take things up about an inch or so. The VERDICT: Whilst I like the concept of this pinafore what I really hate WITH A PASSION is layering . I hate wearing multiple layers with things riding up and down and me constantly adjusting my clothes. 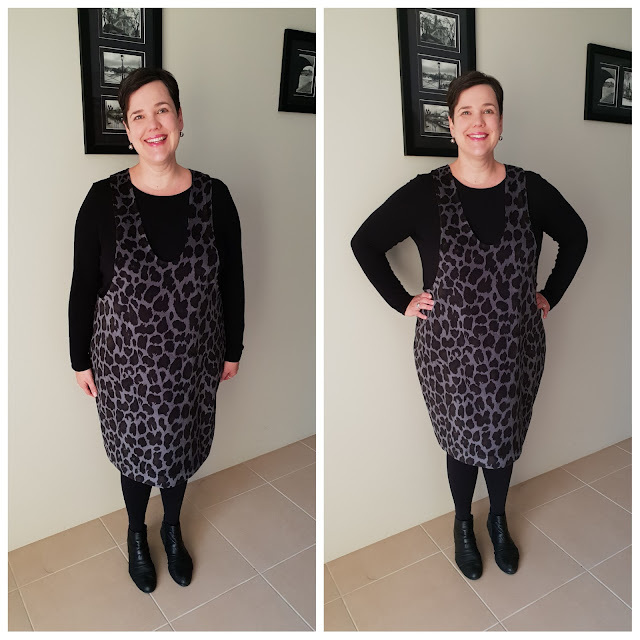 I wore this out to a family do on the weekend and I felt so fat and frumpy. I'm willing to give this another try though once it's shorter and slimmer at the sides; and I'm even thinking of making one in denim that I think would be better to wear in warmer weather - no tights = less layering! Modifications: added 1" to the upper bodice straps for a large bust. Took in side seams about 0.75cm. Changes for next time: sew a smaller size/straighten up the hip; reduce the length.